Carbon emissions from the urban passenger transport sector in Shenzhen will more than double by 2050 under current policies. With the right policies, it is possible for Shenzhen to peak its urban passenger transport emissions by 2030. Reducing new car quotas and raising fuel economy standards are essential measures without which carbon emission will not peak by 2030. Policies needed include raising parking fees, limiting parking supply, increasing EV charging facilities and subway lines, and improving public transport services. Global energy use and carbon emissions are increasingly concentrated in cities, which account for 75% of global energy consumption and nearly 80% of greenhouse gas emissions. 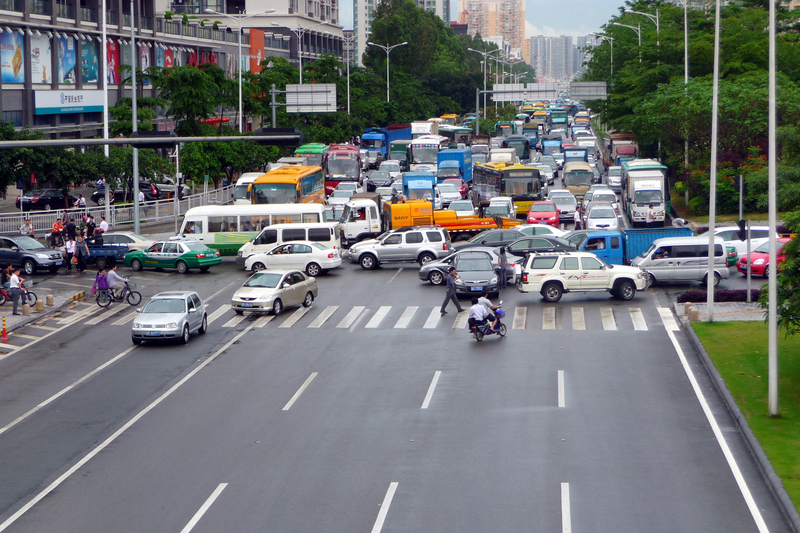 Within cities, transportation accounts for between 15% and 40% of total CO2 emissions. In emerging economies, the transportation sector accounts for the greatest share of the increase in carbon emissions because many individuals aspire to own and drive their own vehicles as incomes rise. China promised to peak its total carbon emissions by 2030 under the Paris Agreement. To fulfill this ambitious target, creating a sustainable urban transport system poses a major challenge. However, given its relatively low motorization rate and underdeveloped transportation infrastructure, Shenzhen, one of China’s leading cities, has the potential to serve as a model for achieving sustainable transport while leapfrogging to a low carbon transport system. Our research addresses two key questions: 1) can Shenzhen peak its carbon emissions from the urban passenger transport system in 2030? and 2), if yes, how can this goal be achieved? Specifically, what policies are needed, when should different policies be launched, and what is the carbon reduction contribution of each policy? We conduct a vision and back casting scenario study to explore the potential for the city to peak its carbon emission in the passenger transport sector. We consider economic, social, technological, and policy drivers that are important in influencing the transport carbon emission but are to experience uncertainty in future Shenzhen and. We define four scenarios based on changes in population, income, vehicle technology enhancement, and urban transport policies to quantitatively assess their impacts on future Shenzhen energy consumption and carbon emissions. Considering the economic uncertainties introduced during China’s “New Normal” transition period and the active role of Shenzhen’s local government in promoting demand and innovation‐driven manufacturing and modern service industries, we consider a business-as-usual (BAU) case and a lower growth rate case. (Figure 1) In the BAU case, Shenzhen manages to maintain its leading economic position among Chinese cities. Shenzhen will be a metropolitan area with over 24 million people and per capita annual disposable income will reach 235,830 yuan (US$33,690, at 2014 price) by 2050, slightly exceeding the current Canadian level, starting from 40,948 yuan (US$5,850) in 2014. If growth is lower, Shenzhen will be substantially influenced by the “New-Normal” transition and per capita annual disposable income will reach only 169,525 yuan (US$24,218, at 2014 price) by 2050, slightly lower than Italy in 2014. In addition to the drivers of income and population, we also consider vehicle technology change and urban transport policies. 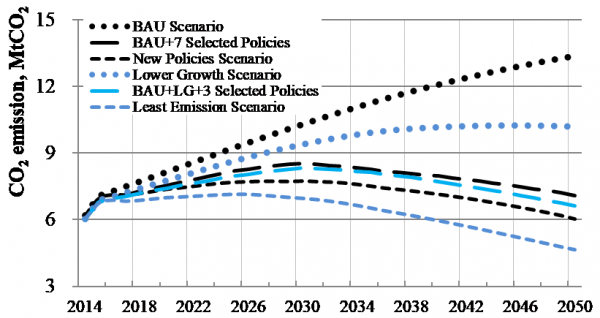 Four scenarios are examined: (1) BAU scenario, (2) New Policies Scenario, in which we replace the policies in the BAU Scenario with more stringent ones, and technologies are also enhanced; (3) Lower Growth Scenario, with the policies being the same as in the BAU Scenario; and (4) Least Emission Scenario, which combines lower growth with new policies and advanced technologies. 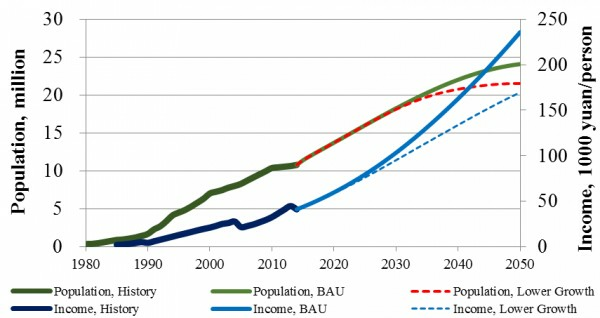 We find that Shenzhen will not peak its energy use and carbon emission before 2050 under the BAU scenario (Figure 2). Rather, energy consumption will continuously increase from 1.57 Mtoe in 2014 to 3.52 Mtoe in 2050, and the corresponding CO2 emissions will also increase from 4.74 MtCO2 in 2014 to 10.23 MtCO2 in 2050. In addition to increased population, two major drivers fuel the drastic increase in transport energy use and carbon emissions. Firstly, citizens’ travel demand increases due to their rising income levels and increasing aspirations for higher living standards. The number of trips and travel distance per person per day will increase from 3.74 trips and 20.08 km in 2014 to 3.91 trips and 25.81 km in 2050. Secondly, the city will experience a process of rapid motorization in future decades. Not only will car ownership increase dramatically from 231 cars per 1000 persons in 2014 to 445 cars per 1000 persons, but also the share of vehicles which are private cars will increase substantially f rom 18.4% in 2014 to 27.4% in 2050. At the same time, the share of trips using public transport (bus and subway) and non-motorized travel (NMT, biking and walking) will drop significantly, from 23.9% and 55.1% in 2014 to 21.1% and 47.9% in 2050. Under the Lower Growth (LG) Scenario (“BAU+LG” in Figure 2), both energy use and carbon emission will witness a steady increase, although at a slower pace than in the BAU Scenario, to 3.5 Mtoe and 10.18 MtCO2 by 2050, without a peak. In other words, with the current stringency level of transport policies, Shenzhen will not be able to peak its carbon emission in the urban passenger transport sector, no matter how fast population and economic output increase or technology advances. However, under the Ne w Policies (NP) Scenario (“BAU+NP” in Figure 2), both energy consumption and carbon emission will peak in 2030 at 2.38 Mtoe and 7.53 MtCO2, respectively, and continue to decrease to 2.01 Mtoe and 5.89 MtCO2 by 2050. Per capita energy use and carbon emission will fall by 55.1% and 56.4% in 2050 compared to 2014. 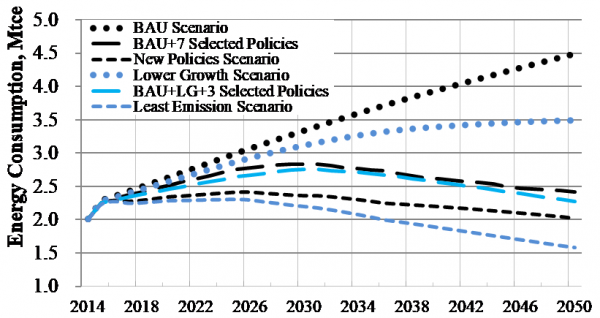 Similarly, energy use and carbon emissions will be reduced even more under the Least E mission Scenario (“BAU+LG+NP” in Figure 2). The significant reductions are attributable to the changes in individual travel behavior and technological advancements with the implementation of new policies. Not only will private car ownership be maintained at a much lower level in 2050 (199 cars per 1000 persons) than under the BAU Scenario (445 cars per 1000 persons), but also the share of electric vehicles (EVs) in the car population will reach 39.7% in 2050, or under the BAU Scenario. Third, the process of motorization will be considerably slowed down. The share of non-motorized transport will be 53.3% in 2050, approximately 5% higher than under BAU. Meanwhile, the use of private cars will be reduced; the share of private cars in all trips will be reduced by 12.3%, and the share of public transport will account for 63% of all motorized trips. Therefore, by strengthening transport policy interventions, Shenzhen will be able to peak its carbon emission in the urban passenger transport sector by 2030. More stringent urban transport policies are necessary for Shenzhen to peak its passenger transport carbon emission by 2030. Under current policies, the carbon emissions of the urban passenger transport sector will continuously increase until 2050 without a peak. We conduct analysis to understand the potential contribution of different policies for carbon reduction. To cap carbon emissions by 2030 under the BAU scenario, seven policies need to be implemented 1) a stringent car quota policy of 50,000 new registrations per year from 2021; 2) a strict fuel economy standard that reaches the European level by 2050; 3) gradually increasing parking fees from an average of 3.5 yuan/ hour to 13.5 yuan/hour (at 2014 prices) in 2050; 4) changing from assuring minimum parking supply to limiting maximum parking supply from 2021; 5) increasing charging facilities for EVs at both home and work starting in 2030; 6) continuing construction of subway lines to exceed length density (in km/km2) of London and reach half of that in Hong Kong by 2050; and 7) enhancing public transport services including punctuality, comfort, transit and waiting time by 2021. Of these, the first two policies (r educe car quotas and raise fuel economy standards) are most essential, without which the peak year for energy consumption will be delayed by five years and the peak year for carbon emission will be delayed by ten years. Under the Lower Growth Scenario, three policies--reducing car quotas, raising fuel economy standards, and enhancing public transport services--are necessary for achieving a carbon peak. Jimin Zhao is Research Associate Professor in the Division of Social Science at the Hong Kong University of Science and Technology (HKUST). Prior to joining HKUST she was a Senior Research Fellow at Oxford University (2007–2011). Her research interests include environmental and energy policy and governance, climate change and global environmental governance, sustainable transportation, energy policy and technology development, and Chinese environmental and energy policy. Her numerous research grants include “Energy Efficiency for China’s Buildings” (Foreign and Commonwealth Office, 2010-2012), “Visioning and Backcasting for Transport Futures in Chinese Cities” (Oxford University’s Future City Programme, 2010-2011) and “Moving to a low-carbon economy under different economic circumstances” (Foreign & Commonwealth Office’s Strategic Programme Fund, 2009-2012). Recent publications include a chapter in Climate Smart Development in Asia: Transition to Low Carbon and Climate Resilient Economies, “Engaging China in a Post-2012 Climate Regime,” “Climate Change Mitigation in Beijing,” and “Visioning and Backcasting for Transport in Jinan”.